Go Get Em Tiger is exactly what the rest of the world hates about Los Angeles. And while that pretty clearly may seem like an insult, I’m not sure it actually is. The best folks in history had their fair share of haters. Jesus had the Pharisees. Abraham Lincoln had John Wilkes Booth. Jim Parsons has me. And if there’s one thing we all know about haters, it’s that they generally sport a little bit of actual criticism mixed with a whole lot of jealousy. Except for Jim Parsons. That’s mostly actual criticism (and I guess a little jealousy over his millions and millions of dollars and fans and probably super hot wife or husband but I will NOT Google it because f*ck that guy). So what is it about this coffee shop that can so easily draw someone’s ire? Well, it’s likely the most trendy coffee shop in the history of the entire world. It’s uncomfortably trendy. It’s trendy in nonsensical ways. Who the hell wants to stand at the bar while they eat and drink? Is that like that standing desk thing? Is it supposed to encourage circulation? And what the hell is with your name? If I want sh*tty platitudes, I’ll go up the street to Café Gratitude (also, no I won’t). Finally, why the hell is your coffee so good? And your breakfast foods! Nestled in the middle of Larchmont Village, which simply looks like the best place in the world to live, Go Get Em Tiger serves up some of the tastiest coffee and breakfast foods in Hollywood. 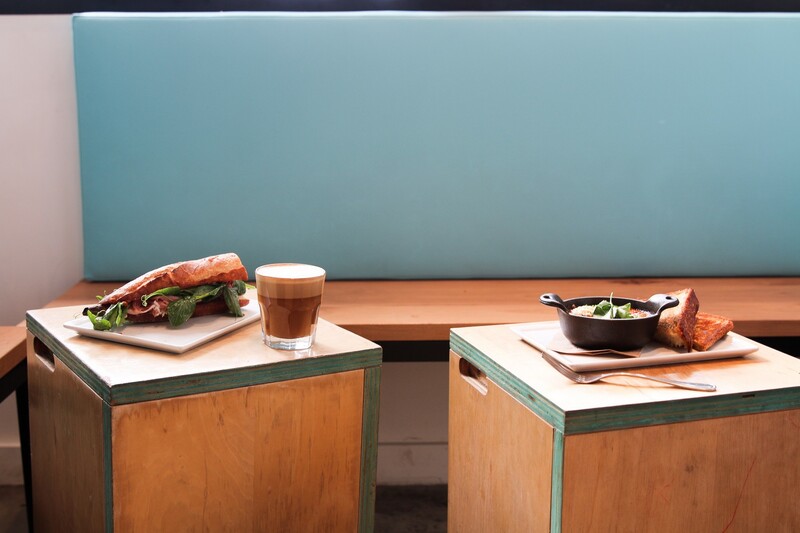 Sure, you pay for what you get, both monetarily and in terms of your soul, but good food is good food and good coffee is sometimes just plain necessary. Especially if you have to deal with this place. Am I being a hater? Sure, but to my credit, I also know when something tastes too good to deny. The breakfast food for people who need a meal in the morning. Meat, egg, cheese,tomato, baked together into a pot of oozy gold. Served up in your choice of a mason jar or that glass your mom had when you were young, these things are tasty as hell. And their pretty-foam-picture game is on point. Not the best. The brie overwhelmed the rest of the flavors in the sandwich, which actually made me OK with the disappointingly small portion. But alas, its hard to compete in the sandwich department when Larchmont Wine and Cheese is serving up some of the best in town across the street.